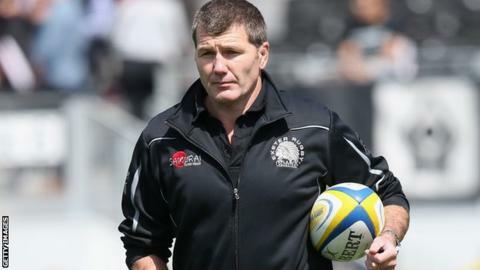 Exeter head coach Rob Baxter says his squad have been "inspired" by narrowly missing out on a place in last season's Premiership play-offs. Exeter finished fifth in the top flight, missing out on a place in the top four by virtue of points scored, having been level with Saracens. "At the moment we look like we might be an inspired team," Baxter said. "What happened at the end of last season bodes well for what's going to come in the next six to eight weeks." Exeter's fifth-placed finish last season equalled their best-ever finish in 2012, although three years ago they were six points off fourth place. "The guys have had a really good focus about themselves," added Baxter, who has been at the helm since 2009 and guided Exeter to promotion in 2010. "You always worry when you've had your best season to date, as we had last year, whether some players will take that as an opportunity to draw breath and think 'everything's great' or whether they get inspired by it. But they want to work hard and want to achieve more." Exeter needed to get within two points of Saracens' winning margin over London Welsh on the final day of last season to make the play-offs. But they fell short as they beat Sale 44-16 while Sarries thrashed the already-relegated Exiles 68-17. "What was so good for us about last season was the season was alive on so many fronts for so long," added Baxter, whose side made the LV= Cup final and the semi-finals of the European Challenge Cup. "We've not been in a season in the Premiership yet where that last game, other than for pride or how it might have affected someone else, has mattered. "That was the first time we were genuinely really playing for something right up until the final seconds of the season. "That's something that I hope the players have been inspired by and that they want to have that experience again - going into the last games in the Premiership with everything is to fight for."